Please check Spire for the most recent class number & schedule. This course is an introduction to fundamental "design thinking" and graphic communication skills in environmental design. This studio based course introduces students to reading and responding to the site through a series of readings, drawing exercises and model explorations. Exercises will progress. No previous design or drawing experience is required. This course is an introduction to the materials, construction techniques and sustainable aspects of those materials commonly used by Landscape Architects, Designers and Contractors, within the framework of the New England landscape and climate. The focus of this course is the residential scale of landscape design and construction although public and commercial construction techniques will also be explored. Materials will be explored through examining material samples, image presentations and the practice of construction detail development and documentation. Natural and man-made materials will be discussed relative to their employment to satisfy certain functional and aesthetic needs. The course will also examine how landscape techniques are not separate from design, but are part of the design process that extends into construction. Read more. Spaces/places in contextointroduction to design processes. The relationship of site context factors and design program to the formation of landscape spaces. A series of small problems such as: courtyard, plaza, small park, ceremonial space, each with a well defined program. Site visits and analysis, diagramming relationships between various activities, and developing an understanding of design processes. Open to BS-LANDARCH and Landscape Contracting majors. Students who do not meet the pre-requisites, may seek permission of the instructor to enroll. The goal of this course is to introduce you to the process of landscape project estimating. Having the ability to accurately estimate the material, equipment and labor requirements of a project and make a profit for the business can make you a valuable asset. Certain portions of estimating can be taught while others come only with experience and specific knowledge of the firm. Over the course of the semester we will explore different types of estimates, establishing hourly rates for crews, as well as base equipment charges, warrantees, making a profit and contracts. Read more. This course is open to Landscape Contracting majors only. Other majors may enroll with permission of instructor. Institutional and commercial scale -- issues of design for commercial and industrial uses. May cover the spectrum from a site plan for an office complex to a marina. Issues of cost, client needs, program, and politics. Site planning -- introduction to concepts of site planning for housing developments. Students perform a detailed site assessment using methods learned in natural factors and previous studio on a 100-acre (+/-) site and apply them to development of a master plan. Students who do not meet the pre-requisites, may seek permission of the instructor to enroll. This is the second section of studio. Students should also be enrolled in LANDARCH 397C. Models of professional office structure: management, organizational behavior, and economics. Guest professionals give insights into the profession and how an office should be managed. Topics include: ethics, contracts, compensation, specifications, contract management, marketing, budgets, and cost analysis. Landscape planning crosses scales from regional to site specific, taking a real world problem to creative sustainable solutions. An introduction to design research methods, inventory and assessment models and techniques for policy planning, regional scale design proposals, and site selection for particular development types. Implementation of a greenway solution. Satisfies the Integrative Experience requirement for BS-LdArch majors. Application of spatial theroy and design process to a specific site context. Develops map reading skills at various scales, strengthens drawing, lettering, and cross-section representation skills. Emphasis on landform design in a public park setting. Introduction to landscape analysis, assessment, and planning with focus on ecological, cultural, and visual landscape issues. Landscape planning from regional to watershed to local levels. Emphasis on inventory skills, map reading, data organization, interpretation, and assessment. Broad introduction to design and planning process. Covers the Renaissance to the present. Interdisciplinary seminar for upper level undergraduate and graduate students. Focus on the role of the built environment in urbanization and sustainability. Substantial weekly readings/discussions and 2 research/synthesis papers required. This course offers a hands-on introduction to innovative material practice with potential applications for landscape architecture use. We focus on the study of upcycled/repurposed materials, smart materials, biomimetic materials, and bio-designed materials. Students develop individual “material experiment” projects in which they test new material applications through prototypes, art installations or demonstration projects. 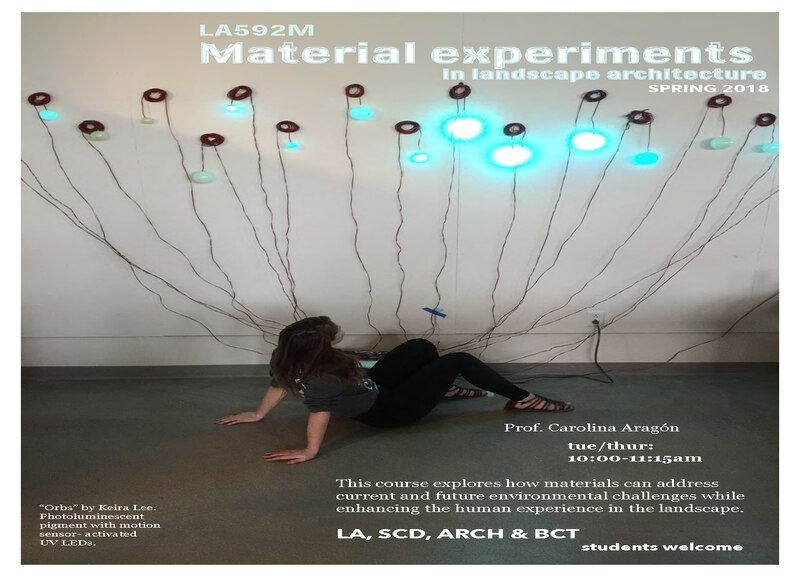 Going beyond the novelty of material experimentation, the course seeks to explore how materials can help address current and future environmental challenges while enhancing the human experience in the landscape. This graduate course is open to UMASS junior and senior Landscape Architecture, Sustainable Community Development, Architecture, BCT and BDIC students, and Five College Architectural Studies and Landscape Studies students. The course is an approved elective for the LARP Climate Change, Hazards and Green Infrastructure Planning certificate. Application of urban design theories as they apply to various scales of urban design, with special attention focused on civic scale design elements and organization of spatial and functional requirements. Introduces students to the process of research, planning, design, and management of historically and culturally significant landscapes through selected real-world site projects. This course will familiarize students in landscape architecture and regional planning with research theory and methods necessary to prepare a successful master’s thesis or project proposal. Students will select a topic for their master’s thesis or project research, ask a faculty member to act as their advisor, conduct a literature review relevant to their topic, and develop research questions. Students will then be required to write a research proposal for their master’s thesis or project, and to have it approved by the LARP faculty member who will serve as their advisor. Students will learn basic skills needed to design a research study, such as developing their research questions and preparing and writing a literature review. Different research methods will be discussed so that students can understand how to apply them to the design of their own research. The course will introduce students to a range of research conducted by landscape architects and planners, including research being done by LARP faculty. Read more. An important course for landscape architects, planners, and other professionals interested in the cultural landscape, this course will introduce students to the identification, understanding, documentation and policy implications of cultural landscapes. While it will touch on the issues of both designed and vernacular landscapes, the focus of the course will be vernacular landscape. This course introduces students to the 3-E concept of sustainability: environment, economy, equity, and applies it to the built environment and policies at the municipal and regional level. This seminar reads some of the most current literature on the future of the urban form given climate change, and allows time and shared space to reflect on what these coming changes mean for (primarily local) government as well as governance. The class focus will be on implications of these coming conditions for built form both now and in the future, with a goal of developing a working understanding of what municipal, regional, and state planners and policymakers need to know now about these conditions to provide leadership to communities. How do you become a more effective public advocate? What do you need to know about the different audiences you want to reach? Few professional experiences are more frustrating than researching an issue, designing a carefully considered planning or policy solution, and then not being able to convince your clients, a community, or others of its significance?or that the issue even exists. For instance, why do so many strategies fail that attempt to get people to care about safe, affordable housing, climate change, the environment, immigration, education, green spaces, good nutrition, mental health, public health, poverty, or the multitude of other central concerns for the public good? We explore typical disconnects between professional and lay approaches, interpreting issues from social, cultural, political, and organizational perspectives, drawing on linguistics, sociology, ethnography, neuropsychology, public policy, and other disciplines. We then explore strategies for bridging the gaps, with each student focusing on areas of personal interest. This is an introductory, graduate-level course in the use of Geographic Information Systems (GIS) in urban and regional planning. Survey of research issues and methods in landscape architecture and planning. Designed to assist students preparing their research for master's theses and projects. Includes selecting a topic for this research, synthesizing the pertinent literature, developing research questions and selecting a faculty advisor. General introduction to methods and techniques for analyzing and solving problems related to planning, resource allocation, and policy analysis. The law of land-use control as expressed in major judicial decisions in the U.S. Creation, expansion and powers of municipal corporations; use of legal planning tools such as zoning, abatement of nuisance, eminent domain, etc. Cities are dynamic organisms whose inhabitants require food, water, shelter, safety, commerce, leadership, and equity. For most people, the city can be a wonderful place to live in. For persons without privilege, the necessary goods and services that are require for a quality life may be lacking. In this course, students will note that every village, town, city, or mega-city has some type of challenge. By examining cities within a global context, students should recognize that any challenge can also be viewed as an opportunity for implementing positive change. As such, we examine global cities in order to ask a central question: what does it mean to be an active and engaged citizen living in any city, town, or village? In this course you will gain a working knowledge of human-environment relations, drawing from a variety of academic disciplines and geographic locations. We'll explore the relationship between the design and use of the physical environment—all you see around you—and the people who do the designing and using. By analyzing the physical environment you will begin to understand the complex and dynamic interaction among individuals, societies and the physical structures of their worlds. This provides the basis for examining different social values and "ways of seeing" found in a variety of societies. How do these values influence concepts of appropriate space-use and design, from the level of the home to the larger neighborhood and beyond? How are they, in turn, influenced by social, cultural and political values? Taking these issues even further, we look at how different concepts of what the environment “should” look like and how it “should” be arranged relate to stereotyping as well as ethnic, gender, class relations, physical and cognitive states, and misunderstandings therein. Read more. In this course we will explore the challenges of a changing climate and investigate frameworks and tools to understand and address climate issues that impact people and their communities. Some cities have begun to incorporate climate change into their planning, taking action to confront their climate threats, reduce their vulnerability to climate-related impacts, and build resilience to extreme events. Continuation of the writing skills developed in freshman writing with an emphasis on content and style appropriate to the environmental design and landscape architecture field. Sustainability is a harmonic balance of the Economy-Environment-Equity trilogy. This class explores the economy element of sustainability, within the context of social equity, a diverse and pluralistic society, and the natural and built environment. Specifically, we will examine economic development at the community or local scale from a practitioner’s perspective. No community can be sustainable if the economy is too weak, in a downward spiral, or is not balanced with other aspects of sustainability. Cities provided unparalleled opportunities for wealth creation and upward mobility, but for many residents, especially low income and minority residents, the likelihood of upward mobility is slim. We will pay special attention to diversity, institutional racism, and economic development in downtowns, post-industrial cities, and under-invested communities. Introduction to the range of computer applications available for the environmental design professions. Site analysis techniques, computer aided design, and methods of data management on the computer. This course is open to SUSTCOMM (Sustainable Community Development, formerly ENVIRDES) and LANDARCH (Landscape Architecture) majors only.